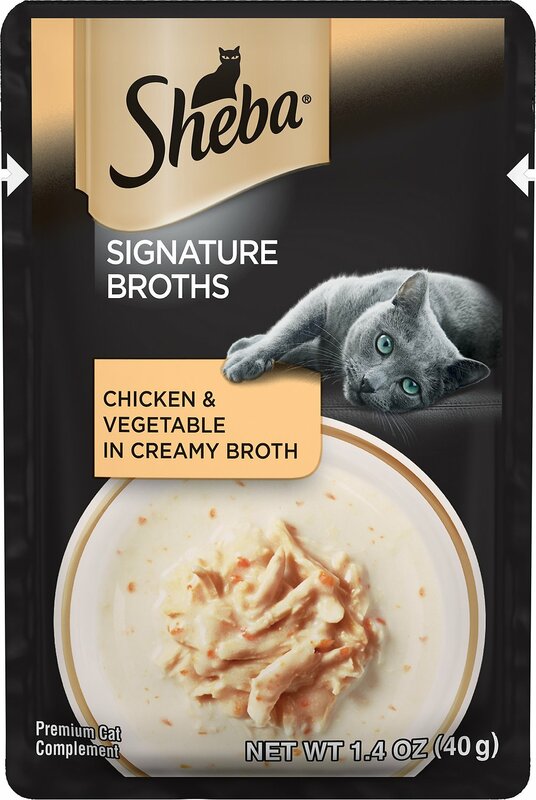 Complement your feline companion’s meal with the simple, yet nutritious ingredients in Sheba Signature Broths Chicken & Vegetable Creamy Broth Cat Food Topper. 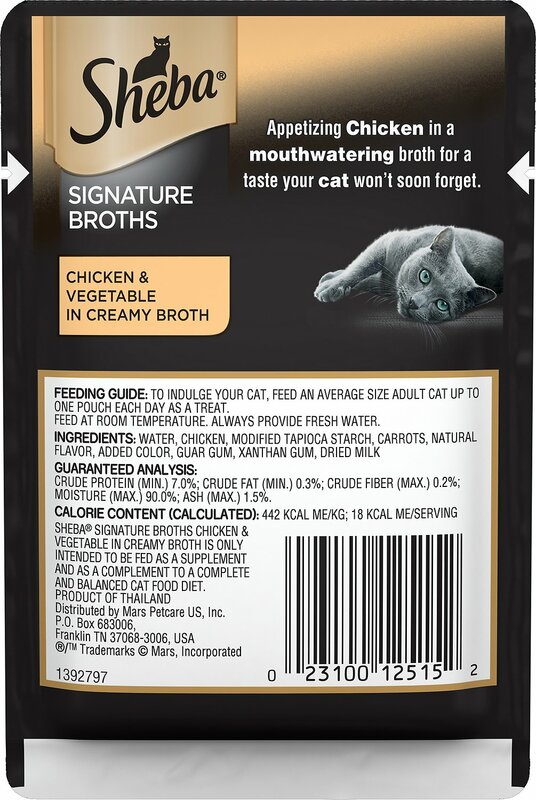 Each easy-to-open cat broth pouch is filled with a delicious selection of chicken and vegetables in a creamy broth for a mouthwatering taste your pal will love. It’s a great way to complement your cat’s balanced diet. Your furry friend will purr with delight as he enjoys every delicious morsel of gourmet broth. It’s the perfect way to enhance your adult cat’s wet or dry food to provide a variety of textures for even the pickiest cats. This signature broth it served best at room temperature, plus it doesn’t contain corn, soy or fillers. Premium chicken and vegetable cat food complement is the perfect supplement to your feline companion’s recommended balanced diet. Serve up to one broth pouch per day—for an average size adult cat—at room temperature as a bonus to wet or dry food. Each easy-to-open pouch doesn’t contain any corn, soy or fillers and can even be served as a treat. These broth-based cat food supplements help make food softer and easier to chew. Case of 24 chicken and vegetable creamy broth meal complement is great even for the pickiest eaters. Water, Chicken, Modified Tapioca Starch, Carrots, Natural Flavor, Added Color, Guar Gum, Xanthan Gum, Dried Milk. Sheba Signature Broths are only intended to be fed as a supplement and as a complement to a complete and balanced cat food diet. To indulge your cat, feed an average size adult cat up to one pouch each day as a treat. Feed at room temperature and always provide fresh water. I have 4 older cats, all over 17, and three of them are missing a great many teeth so some foods are a challenge. They loved these broths and I can even see a difference in one cat’s coat and behavior. He looks 5 years younger. I think it’s because he is getting enough to eat without a struggle and the sauces are good to help him get plenty of liquids. I had no idea how much my cats needed this product until we ordered it. I’m glad I took the auto delivery option! I ordered this flavor as the Chicken & Tuna was not available. I have 4 cats & one is 19 years. At first they seemed to like it but as time has passed none of them will eat it, they just sniff & move on to another bowl. The quality is excellent & nice pieces of chicken. Oh well, I am giving it to the strays & they are certainly enjoying. Hopefully the chicken & tuna will be available for the next auto ship. Thanks to Chewy for the great customer service! The two cats here eat this! Both cats here eat this. The senior, really picky eater just started to eat this after trying this food for the past year! Both cats eat other Sheba foods. My Kitties Love the Juice!!! My finicky cats have recently discovered this treat and it is my fail safe when they are in the nothing you have interest me zone. Only negative is getting all the goodies out of the pouch. Pet food companies need to develop a better packaging system. This product looks and smells great but neither of my cats will eat it.